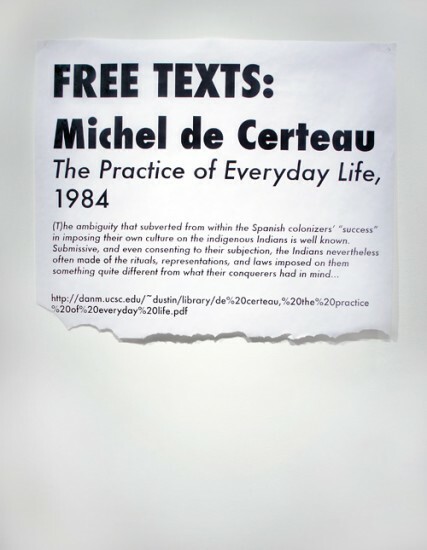 FREE TEXT, as an installation, functions as a physical archive, public reading room and actual printing site for texts dealing with the thorny issues of digital copyright, open source culture, alternatives to capitalism and the state of the intellectual commons in the 21st Century. 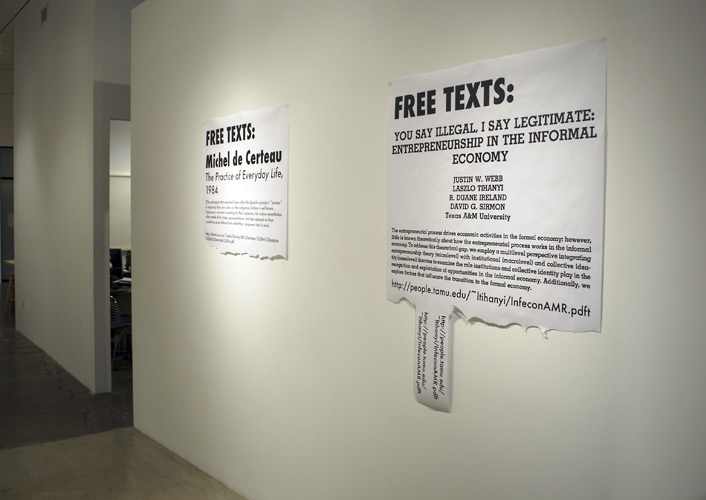 Visitors are invited to pull tabs from a wall of flyers that advertize URLs to download their own copy of text, many of which have been illegally uploaded by anonymous file sharers around the world. A Production Desk houses a laptop, laserjet printer, and thermal binder for on-site printing, staffed periodically by the artist-as-librarian. Printed versions of the texts are available for reading and previewing on the bookshelves. 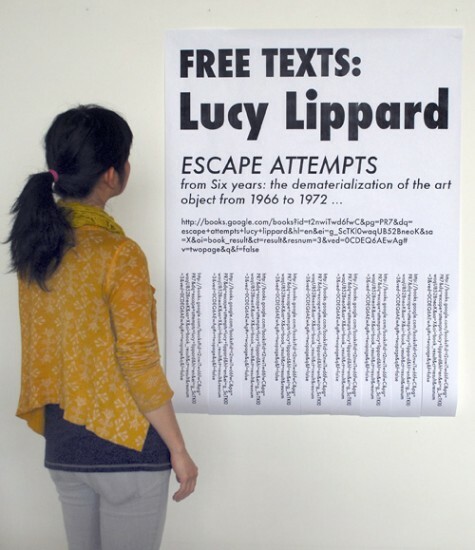 The work was was originally commissioned for the ZERO1 Art and Technology Biennial, San Jose, California, which exhibited September 12 - December 5, 2012. It is an ongoing, accumulating selection of titles, included in exhibitions of The Bucharest Biennial 2014, Galerie Joseph Tang (Paris), Z33 Contemporary Artspace (Hasselt, Belgium), Bangkok Arts and Culture Center, Kronika Contemporary Art Space (Poland), and others. Curatorial contributions by Lian Ladia, Danny Orendorff, Faythe Levine, Ginger Brooks-Takahashi, Narawan "Kyo" Pathomvat, Astria Suparak, among others.